Great service and assistance is finding the right material for the job, the staff at eSheet offer some great advice and are very knowledgeable of the materials, would recommend! We are a small family Company with low overheads and offering you a personal service. We may be slightly more expensive but we will not quote you a low price just to get your business then supply some of the CHEAP but low quality plastics that are being sold on the web today. We supply Companies including BE Aerospace, GKN and many other large companies & individuals. Complex dxf or dwg drawings welcome. Unusual jobs and most types of fabrications are welcome. Mostly all panels can be cut to size and shape. Our minimum order value is about £100 Excl VAT & Carriage except for thin PVC and thin Polypropylene sheets where it is £35. Otherwise email us and we will advise you. We have introduced these minimum charges as we tend to be cheaper at fabricating and the supply of larger orders. We may ask you to pay £5 for some samples to help cover costs. To see more data about each product click the icons below. We do not sell online as the price has to be increased to cover this and we believe you will prefer the lower prices of emailing us your enquiries. Acrylic and related product solutions. Display panels & blocks - Images easily changed. eSheet Ltd is pleased to supply members of the public and industrial clients. 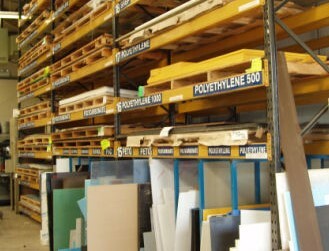 We supply plastics all over the UK and Europe. We supply uncut full size sheets or cut to your sizes on many items and all at VERY COMPETITIVE RATES. We can cut and fabricate to most shapes and finishes as you require. We have available a wide range of processing tools including wall and beam saws, CNC routers and laser cutters. We also have equipment for drilling, threading, bonding and bending materials. We can produce highly polished edges on Acrylic by laser, diamond and flame polishing. We also supply Acrylic and Polycarbonate globes and domes and specialise in coloured domes and spheres and fabricated spheres and shapes. We supply THIN SHEETS (Less than 1.2mm) in PVC & Polypropylene. From 140 microns to 1.2mm are available as uncut sheets or cut by guillotine, punch and knife former enabling us to supply complex shapes. Plastics are supplied from several sites located in the North, South and Midlands of England. The Sales Office in East Anglia does not have a showroom, visitors are welcome but will need an appointment. Minimum order value is £100 Excl VAT & delivery except for thin PVC and thin Polypropylene sheets below 1.2mm where it may be £35.00 minimum Exc VAT & delivery. We may ask you to pay £5 for some samples to help cover costs. Any urgent problems please phone 01945 583541 & we will be happy to help otherwise please use the "Request a quote" button on each product page.